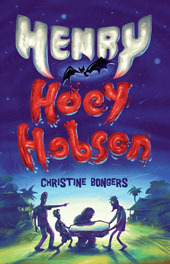 Henry Hoey Hobson is a highly amusing novel for younger readers. Henry’s the new kid at Our Lady of Perpetual Succour. In fact, he’s the only boy in his grade. As if fitting in wasn’t hard enough, the rumour that Henry is a vampire effortlessly continues to grow. Henry tries to prove the other kids wrong by making a splash in the school’s swimming carnival. But he has to keep his overbearing mother and creepy neighbours under control first. Henry is a charming kid, an unlikely hero that readers can relate to, especially when he tries to make friends in various ways. There’s a great scene about Henry playing handball and he can’t keep up with the outrageous rules. Henry has an immense desire to be liked, which gets him into crazy situations. Bongers does a great job in brewing up trouble for Henry. She has created some quirky characters with an enduring appeal. There’s a loving relationship between Henry and his mum that shines throughout the story. Henry Hoey Hobson is an excellent example of how a kid at a new school can make the most of their talents, even when they’re unsure of what it is yet. It is recommended for ages 8 and up.